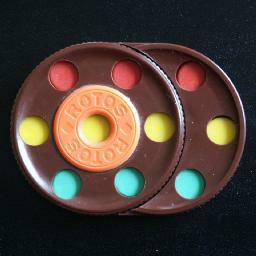 Rotos consists of frame made from two overlapping circular disks. There are 10 round moving pieces held inside, visible through holes in the puzzle frame. Each disk holds 7 of the pieces - one in the centre of the disk and 6 arranged around the rim. Each disk can be turned (by multiples of 60 degrees), so that 6 pieces are cycled around by a move. There are holes on both sides of the frame, and on one side the pieces are numbered from 0 to 9 while on the other there are three red, three green and four yellow pieces. In the solved position the top row has red pieces or the numbers 1-3, the middle row is yellow or 4-7, the bottom row is green or shows 890. This puzzle was made in East Germany in the early eighties and is quite rare. At first glance it seems related to other two-disk puzzles such as Turnstile/puzzler and Rashkey. It is in fact related more closely to Rubik's Rings and Hungarian Rings. Whereas those have rings with 34 or 38 pieces and intersections 6 or 5 pieces apart, Rotos has rings of 6 pieces with intersection points 2 pieces apart. Rotos was invented by Manfred Fritsche, and patented on 4 June 1986, DD 236,263. Manfred also invented the Figurenmatch and Stern, which are discussed on the Pyramorfix page. There are 10 pieces, so there are at most 10! = 3,628,800 positions. On the numbered side all these positions are attainable. On the coloured side of the puzzle the pieces fall into groups of 3, 4 and 3 identical ones, so then there are only 10!/(3!4!3!) = 4,200 distinct positions. I have done a computer analysis of the puzzle in order to find God's Algorithm for them. The results are in the tables below. Analogous to the Rubik's cube, there are two ways to count the moves. The Face Turn Metric means that a turn of either disk by any amount is a single move. The Sixth Turn Metric means that every 60 degree turn counts as a single move. This shows the coloured side can be solved in 8 moves (4.9905 on average), or 10 sixth turns (7.2938 on average). The two positions at distance 8 in the face turn metric are shown below, and are reached by the move sequence R5 L5 R L R2 L R5 L and its mirror image. This shows the numbered side can be solved in 15 moves (9.5509 on average), or 19 sixth turns (14.206 on average). Let a clockwise 60 degree rotation of the left disk be denoted by L. Rotations of 120, 180, 240, 300 degrees are then denoted by L2, L3, L4 and L5. Note that L5 can also be considered an anti-clockwise 60 degree turn, and is therefore also denoted by L'. Turns of the right disk are denoted in the same way, but using the letter R.
Phase 1: Solve the yellow pieces. Turn the disks to bring two yellow pieces together in the left ring. This is very easy. Turn this pair out to the left part of the left ring. Bring the other two yellow pieces together in the right ring, without disturbing the previous yellow pair. This is still not hard. Just make sure that the previous yellow pair never leaves the left half of the left ring. Turn the right yellow pair to the bottom right position of the right ring, and then the left pair to the top position in the left ring. Do R2 L' and the yellow pieces will be solved, i.e. on the middle row. Phase 2: Separate the red and green pieces. The top row will have two pieces of one colour, and one piece of the other colour. Similarly, on the bottom row there will also be a single odd piece. If the odd piece on the top row is on the right-hand side, then do the move sequence L4 R' L R' L, and repeat it as often as necessary to make the top row of one colour. If the odd piece on the top row is on the left-hand side, then do the move sequence R2 L R' L R', and repeat it as often as necessary to make the top row of one colour. Note that this sequence is the mirror image of the one above. If the odd piece on the top row is in the middle, and the odd piece on the bottom row is not in the middle then turn the puzzle upside down, and go back to step a. The only remaining case is when both odd pieces are in the middle of their rows, and this can be solved by L2 R4 L4 R2. Phase 3: (Optional) Swap the red and green pieces. If you wish to swap the top and bottom rows, this can be done by the move sequence L R' L R' L.
Phase 1: Solve pieces 3, 5 and 0. Bring piece 3 to position 3. This is trivially easy. 1. If piece 5 lies at 5 or 7, do R L R'. 2. Turn L to bring piece 5 to position 6. 3. Do R L R'. 1. If piece 0 lies at 5 then do R L4 R' L R L2 R' to dislodge it. 2. If piece 0 lies at 7 then do R2 L R4 to dislodge it. 3. Turn L to bring piece 0 to position 4. 4. Do R L4 R'. Phase 2: Solve pieces 1, 6 and 8. Note that in this phase we turn the R disk only through 120 degrees. This way 3, 5, 0 remain in their positions, except possibly cycled around. Once 1, 6, 8 are correct, a single turn can put 3, 5, 0 back again. Bring piece 1 to position 1. If piece 1 lies at 7, do R4 L', otherwise just turn L until it is in position. 1. Do either L' or L4 to bring 6 to either position 2 or position 9. 2. Do R2 or R4 to bring piece 6 to position 7. 3. Turn the L disk to put 1 back in place. Now piece 6 can be put at position 8 by doing L' R2 L.
1. If piece 8 lies at 6 then do L R4 L R4 L R4 L to dislodge it. 2. If piece 8 lies at 7 then skip 3-5 and go to step 6. 3. Turn L to bring piece 8 to position 2. 4. Do R2, so that piece 8 lies at 7. 5. Turn L to bring 1 back to its position, undoing the turn of step 3. 6. Do L' R2 L to put 6 and 8 correct. If necessary, turn R to bring 3, 5, 0 back to their positions. Phase 3: Solve pieces 2, 4, 7 and 9. 1. Turn R until piece 4 lies at 7. 2. Do L4 R2 L2. 3. Turn R to bring 3,5,0 back into position, undoing the turn of step 1. If piece 2 is at position 7, then do L4 R' L2 R4 L2 R' L4, but if piece 2 lies at position 9 then do L2 R L4 R2 L4 R L2. Now piece 2 should be correct. To swap pieces 7 and 9, do L' R L2 R L R' L R L R L4 R L'.